The easy part of this process is following the seven lessons below. It’s much harder to find a good conversation. The sad truth is, most of us are terrible at holding even a half-decent conversation. We’re in too much of a hurry. We’re too anxious to get our own points of view across, and we tune out when the other person talks. But just occasionally, we’ll find ourselves taking part in a really, really good conversation. We not only listen to the other person, but encourage them to dig deeper and develop their thoughts further. And they do the same for us. 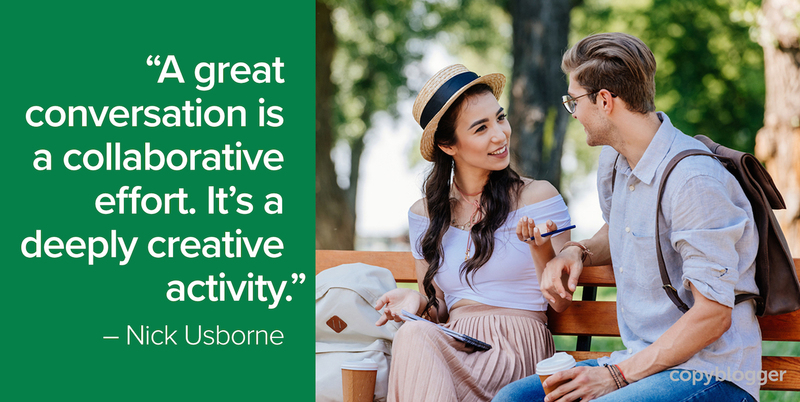 A great conversation is a collaborative effort. It’s a deeply creative activity. It’s also incredibly bonding and rewarding for the people involved. If and when you’re fortunate enough to have one of those conversations, there is a great deal you can learn from them … about copywriting. When you’re part of a great conversation, you listen intently. It’s part of the experience. You don’t just hear what you want to hear. You really get to understand the point of view of the other person, even if you don’t agree with it. You need to do the same as a marketing writer. Put aside your own beliefs and point of view for a moment. Listen carefully to your prospects and customers. And be aware that they may not share your own worldviews. When you understand how they see the world, you’ll be in a better position to write to them in a way that truly connects. Bad conversationalists don’t ask questions. They just talk. But in a really good conversation, both people ask questions. The best of them are open-ended questions. This gives the other person space to explore their thoughts in more detail. It also signals that you care about their point of view and value their contributions. You can do the same as a copywriter. You may not be in an actual conversation with your readers, but you can still send those positive signals by asking open-ended questions in your copy. I don’t ask the question with the expectation of a reply. But I’m still engaging with the reader … asking her to add her own experiences to the mix. This is a close cousin to the last lesson. It’s about slowing down and pausing, allowing the other person to take part and feel valued. In a real conversation, you’d actually pause. A little silence can work wonders when you want the other person to keep talking. As a writer, you can try a couple of things. One of the simplest ways to show empathy is to mirror what the other person is saying or thinking. It turns out, we’re actually hard-wired to do this. Researchers have found we have dedicated “mirror neurons” that light up when we feel empathy for others. Empathy is a powerful force in conversations and it can also be used in copywriting. I’m just suggesting we’re alike. I’m showing empathy for your own struggles as a copywriter and mirroring your own concerns about not getting your text right in your first draft. When you’re selling online, there’s a temptation to push too hard. In our eagerness to make the sale, we cross the line and sound like a car salesman on speed. In a one-on-one conversation, nothing kills the moment as quickly as when one person suddenly starts pitching something. The other person immediately slips into defensive mode and stops listening. Essentially, the conversation has come to an end. The same thing happens with copywriting. As soon as the reader feels you’re only interested in pushing the sale, they’ll disengage and stop reading. Be less salesy and more conversational. Over the course of a good conversation, we’ll share signals of appreciation and gratitude. We’ll smile or laugh. We might even reach out and touch the other person. A light touch on the hand or arm. More explicitly, we’ll say “thank you,” or find some other way to tell the other person how much we value the conversation. Within the one-way environment of a sales page or email, it’s a little harder to express that kind of gratitude. But from time to time, why not just come out and say it? When you’re deep in conversation with someone, you almost certainly don’t pay attention to the length of the words and sentences you use. And unless you’re talking about a highly technical subject, I bet you’d find that your language is surprisingly simple. You don’t need to get all fancy when you’re having a conversation. In fact, the simpler the words and sentences you use, the more easily you’ll be able to convey complex and persuasive ideas. In conversation, we put aside all of the clever writing habits we’ve learned. Keep it simple, as if you were having a conversation with a friend. There are so many books and experts on the craft of copywriting. But if you study a simple conversation, you’ll likely observe essential copywriting skills. Good conversationalists make great copywriters! I can’t reiterate more that simple words will make you able to convey more complicated messages. I read a lot and when what I read is full of fancy words that I need to check a dictionary to grasp I usually tune out and quit reading. Thanks for the great, inspiring and vivid article. Ayman, you’re very welcome. And yes, absolutely… simple words, simple sentences… communicating simple ideas. Back in the day … of complete sentences, no dangling prepositions, never begin a sentence with And or But. Remember those? Some do and still stick to the “golden rules” of grammar and composition. But it just doesn’t work anymore. Conversation is golden. Thank you, Nick for sharing the seven lessons showing us how to make it so! You’re very welcome. Mind you, I’m OK with grammar. It’s the glue that holds our words together. : ) But, yes, I’ll bend or break a rule or two if it helps me share my natural voice when I’m writing. Being able to listen is an art that most people need to master on a daily basis. It is so easy to want to talk about yourself that we forget we are in the business of helping people solve their problems not flaunt our ego. I finished reading an article about inventor Martin Cooper in American History magazine today. The article is titled “Finding His Calling” and it’s about an interview Jon Cohen had with Martin Cooper. When asked about the technology aspect of using cell phones, Martin Cooper responded by saying, “The biggest problem in the world today is people not talking to each other.” So, see there is a place and time for Conversational Copywriting. According to Martin Cooper, inventor of the first cellphone, that time and place is today. Thank you. You never know what you will find while reading. I’m glad what I found makes an appropriate comment for this blog post. I like the part about asking questions. The other day I was lucky enough to have the opportunity to try an exercise that was new to me, a socratic walk. It requires only 2 people. Both individuals write a list related to a specific topic, maybe personal values. Then on the walk you can only ask the other person questions. No statements or giving advice. That sounds fascinating. How did it go? Another small set of “rules” I like are the ones for improv comedy. When someone says something, you have to agree, say yes, and then add something new. Totally breaks the habits of “bad conversations”. Empathy in real-life conversations usually gets going when one person has expressed or revealed a vulnerability. In marketing, though, it can be dangerous to offer empathy based on assumptions about the audience. It can be the equivalent of offering sympathy or help to a blind person who in fact is perfectly capable of managing the situation. Note that in your empathy example you said, “I’m guessing.” Sometimes such a guess is presumptuous or off-target in its unconscious assumptions. I am thinking in particular of one case where a marketer was constantly talking about how life was hard. She did this, I’m sure, to be empathetic. In truth, she had a lot of helpful ideas to offer whether or not one felt life was hard. But because she said such things so often (much more often, I believe, than she herself realized), she drove away people like me who didn’t feel life was hard, and she probably kept the listeners who resonated with her assumption, who were in turn much less able to pay her coaching fees and more troublesome to keep as clients. What this taught me was that empathy has to be handled with care in marketing. It also, I believe, shows the limits of the metaphor of copywriting as conversational. Copywriting can try to be conversational, but in most settings it is missing the dynamics of actual conversation. Excellent feedback, Marcia. As always! About the “life is hard” example, I’d put that in the “pretend empathy” bucket. Which is almost as bad as the “pretending to be your friend” bucket. If you really want to be empathetic, do it. But don’t use it as a marketing device. That’s just BS. And yes, conversational copywriting will always miss the dynamics of a true conversation. But I don’t think that detracts from the benefits of working with a conversational mindset and using conversational language. Conversational language signals your intention to be open, honest and transparent with your audience. And that’s worth a lot. Andy, hi. Absolutely. All you need do is try voice search with Google… and you can see how advanced they have become in recognizing and processing natural, conversational language.